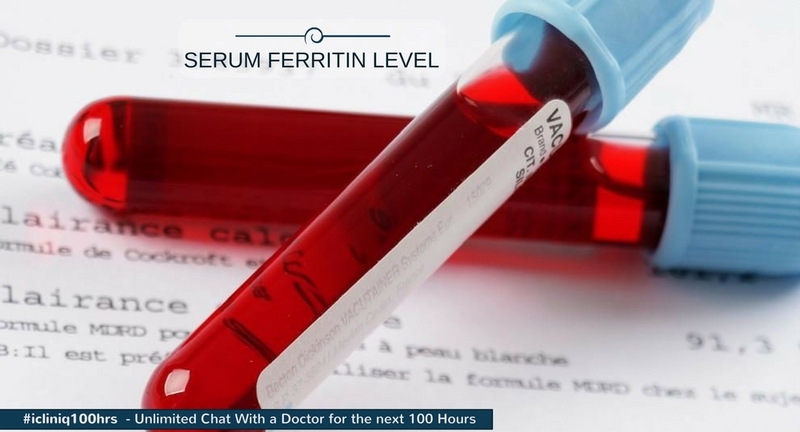 How to reduce my serum ferritin level? iCliniq › Ask a doctor online › Answers › Hematology › High Ferritin › How to reduce my serum ferritin level? My ferritin level is 1500, and I want to bring it down to 150. How much will one DFO IV session or each Exjade pill reduce the ferritin level on an average? I am a healthy individual, and I do not have HIV, HCC, or any other disease. • Can you please provide a diet chart for a thalassemia patient? • Is thalassemia minor genetic? • What diet will you recommend for a beta major thalassemia patient? Your serum ferritin is high, so the cause should be found out first. It can be hemochromatosis, in which excess iron is stored in the bone marrow. Deferoxamine is used for increased iron storage in thalassemia patient. For high ferritin, phlebotomy is also another mode of treatment. Hence, consult a nearby physician or hematologist for examination and discuss the treatment plan. Take care. Hope this will help you. Thank you for replying. I am already aware of these things. I usually use phlebotomy, but it takes a while to get it to 150. We have checked for other diseases in the past, but there does not appear to be any disease. I simply absorb more iron, and I think I eat iron-rich foods. I want to understand more about the subject before approaching a specialist, so my questions can be more informed. So to put it perhaps another way. If you were treating a newly diagnosed person with thalassemia or another disease, where there is too much iron in the body, and you want to remove it, how much would each pill of Deferoxamine or each IV treatment of DFO decrease serum ferritin on average? I am looking for some specific numbers. Obviously, an average, with a range, as I expect it would vary from person to person a bit. But roughly, what kind of orders of magnitude would the ferritin drop after the IV or after each daily pill? I am trying to get an idea of how effective it is per dosage, so I can compare it to giving blood, which I am familiar with. So, I am looking for a specific, numerical answer, if you do not mind. Thank you. You have an excess iron load. The causes can be thalassemia, sideroblastic anemia, liver problem, transfusion-induced iron overload, etc. Deferoxamine, which is available as 500 mg vial. It can be reconstituted with sterile water and recommended dose is 20 to 40 mg/kg/day. It is given as a slow subcutaneous infusion over 8 to 10 hour for five days in a week. Deferiprone, which is available as oral preparation as well. As per statistical data, 100 mg Desferal (Deferoxamine) can chelate around 7 to 8 mg of ferric iron. This iron chelator has side effects like allergy, agranulocytosis, retina affection, etc. Hence, it is not given unless indicated or is given under strict monitoring. Moreover, iron chelator will not chelate all types of iron. If no secondary cause of iron overload is present, then congenital mutation or atransferrinemia might be the cause. Phlebotomy of 500 ml blood can chelate around 200 mg iron, once or twice per week is the treatment given until serum ferritin is less than 50 mg/L. And maintenance phlebotomy is done for a few months. Hence, consult a hematologist for examination and discuss all this. Vitamin C help in more iron absorption, so citrus fruits can be restricted. That is helpful. So, 3 mg per day with subcutaneous versus 200 mg for a blood donation. It does sound like the blood donations are far more effective. How does 200 mg translate into ferritin levels? If I lose 200 mg of ferric iron, how much roughly does the ferritin drop? As you gave me the statistics for DFO subcutaneously, how much are the comparative figures of iron chelation for each pill of Exjade and Deferiprone? How many grams of ferric iron would that bind? If you can give me these figures, I will be able to make an informed decision. We do intend to test genomic factors too. Thanks. I appreciate your awareness regarding your condition. First of all, do not worry. When you consult a nearby hematologist, he will examine you and will suggest necessary investigations for the cause of hemochromatosis. If needed, the hematologist will advise you to test for genetic mutation study by PCR (polymerase reaction) also. Usually, phlebotomy will be a good option for you if you are not thalassemia patient. Phlebotomy removes the red blood cell with attached iron in it. Hence, it is much more effective than iron chelator. Around 500 ml blood removal will clear 200 to 250 mg iron. Phlebotomy is done up to your ferritin reaches below 50 mg/L or below 25 ng/dl. Iron chelator as a subcutaneous infusion or other parenteral route is more effective as compared to oral route. All parenteral route have almost the same effectiveness in chelating iron. No further conclusive statistical data is available as per my knowledge. So consult a hematologist, discuss all this. After serum ferritin comes within range, your doctor might put you on a maintenance phlebotomy as per need. Take care. Hope this will help you. Wish you good health. I have a swollen lymph node in the armpit. Does it indicate any health issue?